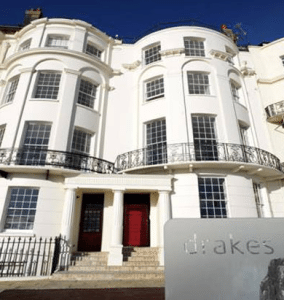 Drakes is a multi-award winning boutique hotel and restaurant, located along Marine Parade, looking out towards the sea. Opening in 2004 and immediately gaining recognition, Drakes continues to raise standards and serve delicious, high end cuisine. The Restaurant at Drakes has scored top amongst Brighton restaurants in the Good Food Guide for the last six consecutive years and boasts accolades, not only for its outstanding food, but for quality, design and service. With locally sourced produce and a highly acclaimed chef to boot, when I was kindly invited to Drakes for what was certain to be an extra special breakfast, how could I say no? Inside this beautiful Georgian town house, so typical of the kind that adorn the Brighton seafront, we are welcomed in and shown downstairs to where breakfast will be served. I am taken aback by the modern, relaxed, but sophisticated feel to Drakes. The décor is simplistic, but thoughtful, with little details that illustrate the care gone into the interior. I read on their website that the aesthetic has been carefully designed to mirror the philosophy of drakes’: ‘the highest service standards combined with the comfort, subtlety and discretion today’s luxury traveller expects, all delivered in a laid-back & relaxed style’. We are given our pick of table, as we are the first to arrive for Breakfast. 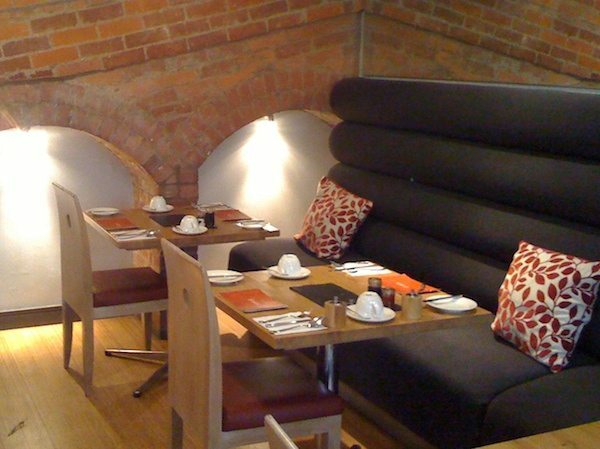 We choose a table that makes use of the sofa style seating on the far wall of the restaurant, as this seems like a nice, comfortable way to enjoy breakfast. and a bowl of brown and white sugar cubes. In addition to this we notice four lovely little jars of jam and a marmalade, which have clearly been homemade and carefully selected for their varying colours and flavours. The waiter explains that the marmalade is made from Seville oranges and is somewhat of a secret recipe. The consistency is almost like treacle; it looks very sweet and indulgent and we can’t wait to try it. 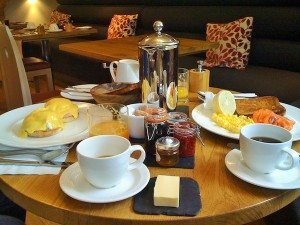 We order a pot of coffee to share and excitedly check out our breakfast menu. Supposed to be the most important meal of the day, breakfast can also be my favourite meal of the day! I don’t mean a rushed bowl of cereal, eaten on a week day morning before work. I mean those breakfasts at the weekend that you can actually spend time making…and eating. Even better than this, are those breakfasts you get someone else to make for you, those which you may not venture to create yourself. There is nothing more indulgent than a breakfast out, because it can seem slightly unnecessary, but it always feels special…and Drakes’ breakfast menu does not disappoint us here. It is soaked in ‘special’, with the ‘Full English’ and ‘Vegetarian Full Breakfast’ boasting nothing but the best ingredients: vine tomatoes, field mushroom and free range eggs, among others. Little touches such as the ‘marmite soldiers’ served with two, soft boiled eggs, add a twist to this breakfast classic. Florentine’, ensure the menu has an element of classiness. 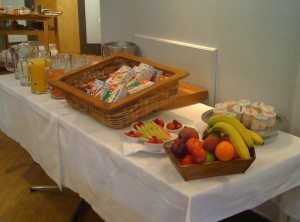 In addition to this, all breakfasts come with a hot beverage, white or wholemeal toast and any items from the buffet. If preferred the ‘Simple Buffet Breakfast’ can also be ordered on its own. Having already been up to contemplate the buffet, we are aware of the goodies up for grabs. 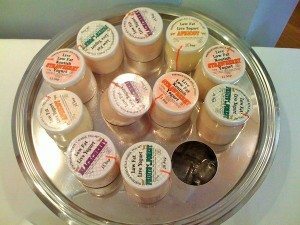 Particularly enticing, are the locally sourced fruit yogurts in several flavours, supplied by a dairy in Rye. 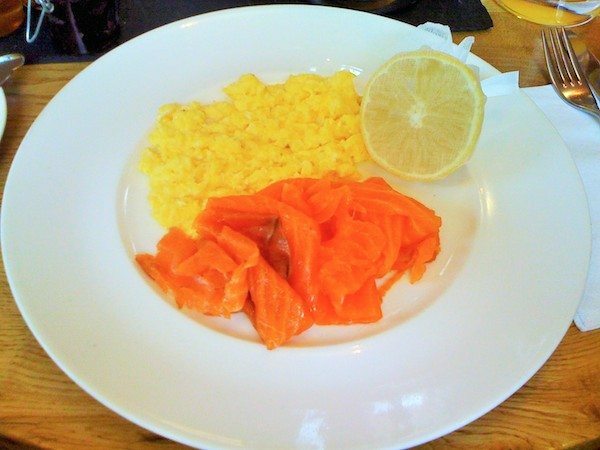 I select myself one, to go on the side of my main breakfast, which will be the ‘Smoked Salmon and Scrambled Eggs’. between the ‘eggs benedict’ and the ‘eggs florentine’. Both quite similar, just with one variant: one comes with ham and the other with spinach. I suggest he ask for a mixture, then he can have the best of both worlds. Our very accommodating waiter is happy to oblige, so my friend goes ahead and orders a hybrid breakfast: eggs-benedict-florentine. 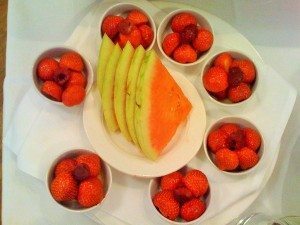 We also help ourselves to some freshly squeezed orange juice and grapefruit juice from the buffet, along with a ramekin each of beautifully arranged, fresh strawberries. Back at the table, it pleases me no end that our coffee has been served in an ample sized, cafetiere, as it means I have free reign to drink as much as I like…one little cup is never enough! sourced from the UIG Lodge on the Isle of Lewis. It is silky, smokey and melts in my mouth. The scrambled eggs are perfectly made. Just the right amount of cream and flawlessly seasoned, a wonderful companion to my salmon. A drizzle of lemon, adds a zing to the dish, bringing all the flavours alive. Accompanied by a slice of seedy, wholemeal toast, I am in breakfast heaven! 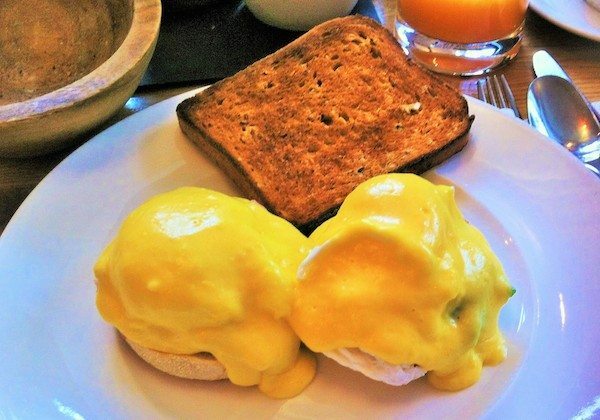 My friend’s eggs are impeccably poached, which is no small feat. 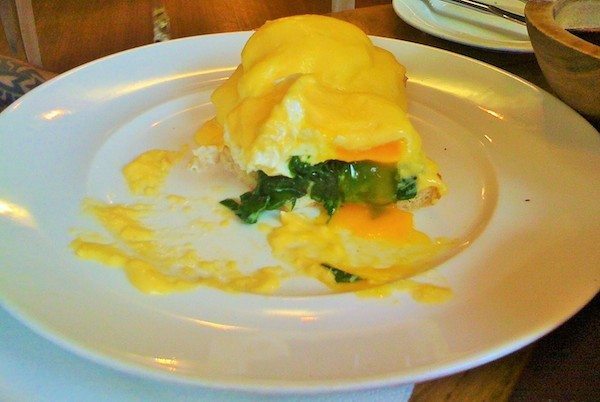 The sliced ham is thick and plentiful and the spinach, bright against the hollandaise. It has been a wholly satisfying breakfast. Every angle has been covered. Not normally one to be bamboozled by fancy furnishing and certainly not able to describe myself as a ‘luxury traveller’, I have to say, that when it comes to Drakes, even I could get used to the finer things in life! Every inch of this place resonates pure quality and care. With Breakfast, every detail was considered and delicately executed. Everything looked artistic, felt classy and tasted fantastic. A seriously, scrumptious breakfast and a truly delightful way to spend a morning!